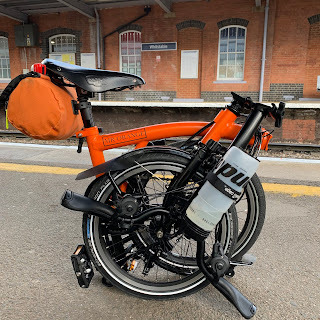 My Orange Brompton: Cargo shorts made for Brompton riding??? I ventured into a Specialized Concept Store today. I have been to this establishment before when I was toying with the idea of a Brompton. At that time I was focused wholly on the joy that is the folding wonder and didn't pay much attention to anything else. Looking at some of the price tags I was amazed by what I saw. £2500 seemed mid-range for the arse up, head down jobs. I know what some you might be thinking as I was - I could buy 2 x titanium Brompton's or my favourite colours in the steel variety. The real reason I had gone there today was to find a pair of cargo shorts that has the padding on the inside, thus not showing the gel pack and baboons bum, as I call it. I am beginning to think this might be the Holy Grail as I have yet to find anything vaguely urban. The pair I bought for the BWC Launch ride are not to put too fine a point on it, rubbish. Perhaps those of you in the know could offer suggestions.